Over the last several months we’ve been working on what we believe will be an amazing new resource/capability for ShopBotters who are professional cabinetmakers or furniture makers. That resource is eCabinets — a leading design and production system for cabinets and furniture. eCabinets is a groundbreaking concept owned and developed by Thermwood. The basic eCabinet system is free to professional shops and can be used for all aspects of custom cabinet production, from designing, to costing, to providing great renderings for marketing to customers. The system has a number of production features useful for general woodworking and it has always been tied directly to Thermwood’s CNC routers for full production cutting. The eCabinet system is also at the core of Thermwood’s “Production Sharing Program” that allows cabinet shops to outsource their work to shops with time available on their Thermwood CNCs. 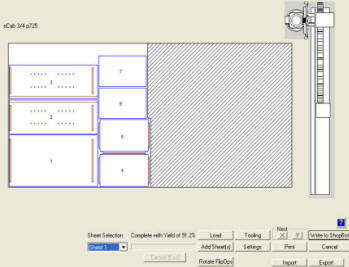 A view of the eCabinet/ShopBot Link interface. Here’s a small cabinet automatically nested for cutting. eCabinets itself is free to professional woodworking shops. You register on the eCabinet site and will receive a CD with eCabinets on it. To be able to cut eCabinet projects, a ShopBot owner will need to purchase the eCabinet/ShopBot Link ($1295) from Thermwood. This is a software module (it comes on a CD and includes a dongle) that allows an eCabinet file to be previewed in the ShopBot software and cut on a ShopBot CNC. You’ll need the latest ShopBot software to use the eCabinet system and this means that you also need to have a ShopBot with a current control system. That would be either a PRTalpha, a PRTv4g, or any of our PRSalpha or PRSstandard CNC tools. You can check out what eCabinets can do by exploring the website and studying the features. If you find it appealing, you can sign up. This is all no cost, no risk to you — so you are able to fully evaluate the cabinet system before paying to hook it up for cutting on a ShopBot. If you aren’t already familiar with eCabinets, check it out. You will learn that it is a highly-regarded cabinet system, comparable (some consider it better) than the leading commercial packages. It now has additional library functions (see below) that make it even more attractive. eCabinet project displayed in Preview Mode. Of course, we at ShopBot believe you’ll be excited about the cabinets you can produce. 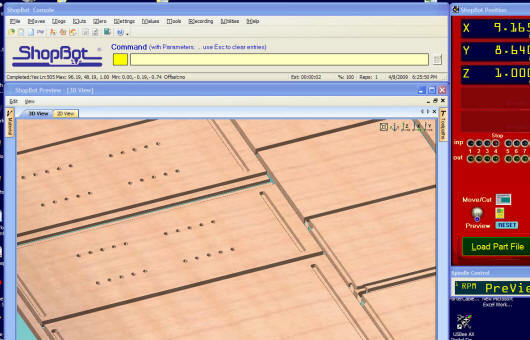 We’ve worked with the Thermwood developers to make sure the translation to our tools works well. Other resources are available on the eCabinet site and ShopBotters are encouraged to participate in the eCabinet Forum and Production Sharing program. You can also purchase tooling and other accessories from the eCabinet site, including the special cutters that work with the dovetail features of eCabinets. eCabinets has some great training resources. Of course, you can always go to Dale, Indiana for a week of training with the big guys — and I’m betting this would be quite an experience too (how about a Camp ShopBot there for about a dozen of us?). But to get you going at home, there is an hour free web/video tutorial that takes you through basic functions in eCabinets. Thermwood has also developed 30hrs of web/video training that will make you an expert ($950). You can share this video training with all the people in your shop in a time framework that suits you. For those of you who are curious, ShopBot and Thermwood have been talking for several years about how we might energize the CNC cabinet-making market — realizing there has been room for innovation and creativity at the low-end of affordable CNC as well as opportunities to achieve a broadening of attention to CNC and the value of high volume production tools in cabinet manufacturing. We’ve considered several possible approaches for energizing CNC. I am really excited that we are announcing this complete implementation of eCabinet functionality for ShopBots. I think it says a lot about Thermwood’s leadership and broad interest in our industry. We look forward to continuing to work with them. 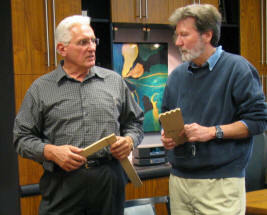 For Thermwood, this eCabinet release is part of a broader program. They have markedly enhanced the usability of the eCabinet system by providing extensive new libraries of cabinets, furniture, and carvings that are available to all eCabinet users — these are ready-to-cut or to be modified and customized. eCabinets is also being opened up to CNC panel saws and Tiger Stop systems in order to more broadly integrate all aspects of cabinet production. For ShopBotter cabinet shops and furniture makers, this means you are getting in on something big — and it’s happening at the right time — as we all re-organize and develop new ways to be productive in the coming recovery.